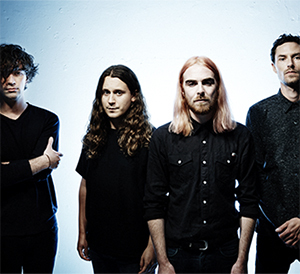 Hardest rocking Leeds quartet Pulled Apart By Horses return this month with their first new music since the release of 2014’s Blood album. Back with a brand new track, ‘The Big What If’ (recorded at McCall Sound in Sheffield with Ross Orton), a UK tour in March and April of 2017 and much more to come besides, Pulled Apart By Horses are once again ready to give those jams a massive kicking. And so it begins… a creeping, strutting riff. Pounding toms, crackles and distortion before the horses detonate and ‘The Big What If’ explodes out of your speakers, asking big questions and attacking you with an even bigger sound. It’s a sprawling, epic, brain-melting, psychedelic rock blast that takes everything we’ve come to expect from our favourite horses and then bravely drop kicks our perceptions into the void to somewhere else entirely. “From me and the other boys in the PABH camp I can safely say that we’re all overjoyed to unveil this new beast kicking and screaming into the cosmos,” reveals singer and guitarist Tom Hudson. “It was created on a diet that consisted mainly of garage rock, fuzz & a curiosity of the unknown. I’ve never been here before, the blood is rushing to my head,” howls Tom amongst the adrenalin rushing chorus of ‘The Big What If’. Pulled Apart By Horses are back and they’re bravely and courageously travelling to new worlds and beyond. Come follow. A new album will follow in 2017. Stay tuned.